These steps add to general level of trust, prepare us for bigger moves, says Ajay Bisaria. Although there have been no official announcements about a positive movement on India-Pakistan relations, there are signs that both sides are looking at “windows of diplomatic opportunity to move forward”. The steps taken include exchange of prisoners and progress on other bilateral agreements, besides meeting of Indus Water Commission and scheduled meetings of Coast Guard teams. Speaking to The Indian Express, Indian High Commissioner to Islamabad Ajay Bisaria delineated this thaw. Official sources in Delhi told The Indian Express that they are closely watching the unfolding events in Pakistan, which includes the ongoing tussle between former PM Nawaz Sharif and the Pak Army, the forthcoming elections and the outcome after the results. The unilateral announcement by the government of a ceasefire for the period of Ramzan in Kashmir is likely to send the right signal to Pakistan, sources assessed. “We have to see how this circus plays out (in Pakistan), but we will be ready to move at a very short notice. There will be a window of diplomatic opportunity to take small steps and move forward,” sources said. Sources, however, refused to specify or elaborate on the steps that can be initiated by the two sides. About the dominant view in both capitals that political leadership in Delhi will not be keen to move before 2019 general elections, sources said that “it would be a self-defeating and dangerous proposition to make”. 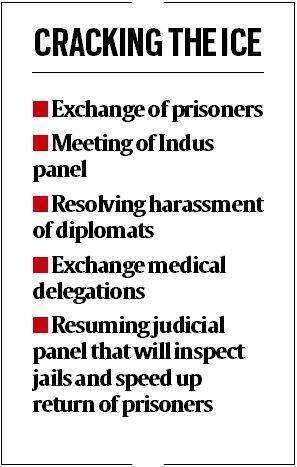 These steps would nevertheless signal another shift in the BJP government’s flip-flop policy towards Pakistan, since Narendra Modi became PM in 2014. It has fluctuated between personal engagement with Pakistan, from Modi landing at Lahore in 2016 and inviting Pakistan intelligence agencies to Pathankot air base after a terror attack, to stalling the SAARC summit and taking a proactive stance on the LoC. While a new civilian government is expected to be in place in Islamabad by August, the Pakistan Army has made it clear that it will have a say in the country’s policy towards India. “Pakistan Army will sit with the civilian government and as is the system in all countries, governments do no act without inputs from security forces. Pakistan is no exception,” Major General Ghafoor said. Sources in Delhi dismiss it as an “internal matter” of Pakistan, wherein they will deal with whoever is in the government. They stress the multiple rounds of talks between the NSAs of two countries to highlight their policy for engagement. As reported by The Indian Express, the two NSAs had secretly met at Bangkok on December 26 last year, even as tensions rose between the two countries following the treated of arrested retired naval officer, Kulbhushan Jadhav’s family in Islamabad. “We have successfully dealt, through quiet, calm and persistent diplomacy, with the issue of harassment of diplomats. We hope to go about our business of building bridges in Islamabad and creating a positive context for future initiatives,” he added. The harassment of officials of Indian High Commission in Islamabad started on February 15, with a raid by the ISI on the residential complex of the High Commission which was nearing completion. When the Pakistani side did not relent for two weeks, New Delhi retaliated. By end of March, quiet diplomacy had started between the two sides which led to a statement by both the foreign ministries on March 30 that they will abide by the 1992 “Code of Conduct” for treatment of Diplomatic/Consular personnel in India and Pakistan. Meanwhile, the Indian High Commission is hoping to shortly move into its new residential complex in Islamabad which would make their harassment more unlikely. The complex was inaugurated on April 2 and some personnel of the High Commission have already moved in there.